Upgrading your bathroom can be a very effective way to brighten up and add life to your home. It can however be a difficult and time-consuming endeavour if approached in the wrong way. You should also consider the hand of a professional to get it right on the first try! Of course you can get clean with a 10-year old single spray showerhead, but getting clean might not be all you want. A shower should be an experience – a relaxing and satisfying one. A multi-function showerhead can provide a variety of spray patterns for different purposes, and can save you money in the long run if your current unit is inefficient. The appearance of a vanity can change completely with a new faucet. Additionally, the fact that older faucets have a higher flow rate than newer ones would mean that replacing your current faucet will make your bathroom more efficient on water. An array of styles that can fit with virtually any bath décor are available at bathroom and kitchen showrooms and home improvement stores, and it’s up to you to pick the model that suits you. 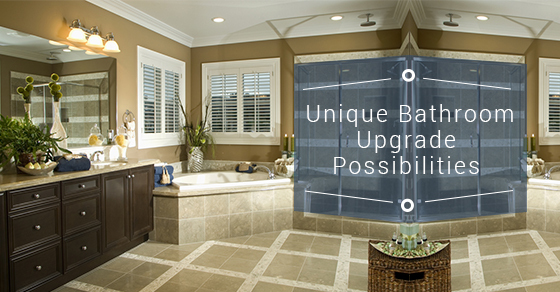 Sure, your living room will look great with new window treatments, but so will your bathroom! Splurge on whatever design you think would work in your bathroom – full-length sheers, valances, mini-blinds, roman shades, or other linens. Replace your shower curtain with a more upmarket one, and that matches your new window treatments. Finish off with a new set of towels. With your faucet replaced, it’s time for the drawer pulls and cabinet knobs. Look for a set that matches your faucet’s style – eclectic, contemporary, transitional traditional etc. to create a pleasant, cohesive look and feel for your general bathroom design. Repainting is an economical way of completely changing the look and feel of your bathroom. You will only need a gallon of paint at most. Doing it yourself can save you some money, but if you’ve never tried it before and you really want to get it right, you may want to consider professional services. Consider these tips if you want to upgrade your bathroom on a budget, and talk to our team today for more information on how!